On Moonlight Lane : Been Away Toooooooo Long! Yes, I have not posted in far too long......Thanksgiving was my last post. There have been a few distractions on Moonlight, the greatest of them all was Mr. B's bypass surgery. A bifurcated aortal-femoral bypass to be exact. Say that three times really fast! After a week in the hospital and weeks of recovery at home he is doing really well. Lost a good 30-40 pounds (green with envy) and only slight swelling in his feet remain. So here's a funny, the new Skinny Mr. B was pumping gas the other day and his pants fell down! Yup, right down to his slightly swollen feet at the Arco station. Gosh, I wish I had been there! I have fits of laughter just imagining the fumbling with gas pump, keys, credit card and denims. He believes no one saw said slippage save possibly the people in the Burger King drive-thru waiting for their scrumptious meal. Please make a mental note of this incident should you ever need this surgery and purchase a good belt or suspenders. With my distraction during the holidays, I was never able to bake and share goodies with my neighbors. So I decided to make amends with a St. Valentine's goodie bag for all my dear ones on the lane. The widows; Doreen, Jean-Marie and Carol. The marrieds; Fidel & Cathy and Ruth & Gordon (Yes, I do think of the movie Harold & Maude every time). 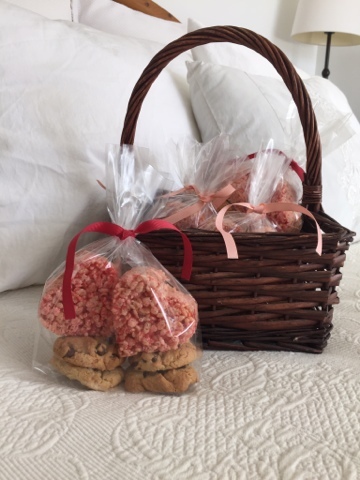 With my famous recipe of chocolate chip cookies and inspiration from a recipe-tweak to Rice Crispie treats from After Orange County, I lit up the faces of my neighbors with my sweetheart gift. So nice to bring a bit of sunshine when widows are feeling especially lonely and the marrieds are longing for a surprise. The hugs of gratitude were my gift and cherished. Hope your St. Valentine's Day was a sweet one!